Victoria Cross believes her greatest challenge in life is keeping up with family duties. But a tempting stranger, an unexpected responsibility, and a ruthless killer combine to complicate her life. And in the end, this young wife and mother's biggest challenge may turn out to be ... surviving. This scene was fun for me to write because it centers around such a compelling dream. I mean, who wouldn't love to receive such a generous bequest? But at one point Harry Price has told a friend that money can bring with it as many problems as solutions. And this is what Victoria learns as she struggles to overcome Harry's death and dispose of the remains of the gentleman's life. Because remember, there is a killer out there. He's killed at least once. Who is to say he will not kill again? Then, one day the phone rang. It was a Tuesday again. As usual, I was home catching up with my chores. "Mrs. Cross?" a voice asked. "I'm Matthew Ashworth, Harry Price's attorney. First, let me tell you how sorry I am for your loss. Harry was a wonderful man. It was my pleasure to know him." "Thank you." Considering Ashworth's comment, I had felt compelled to provide a suitable reply. Although, I couldn't understand why Ashworth was offering his condolences to me? I'd never even met Price. "I'm sorry for coming at you unexpectedly like this," Ashworth said. "But it is the way these things sometimes go. Anyway, I'm calling to tell you that you're named as Harry's heir." "I'm listed as an heir?" I pulled a chair out from the kitchen table and sat. "Actually," Ashworth said, "you're the sole heir." "But why would Harry leave anything to me?" "I don't know, but you've also been designated the administrator of the estate." "Basically, it makes you responsible for inventorying all of Harry's possessions. Then, you'll need to file a statement with the court, swearing everything has been settled according to Harry's wishes." It sounded like a lot of work. "Where would I be doing this?" "I'm sorry. I thought you knew." I sighed. "No. I've heard Harry was from someplace in northeastern Pennsylvania, but I don't know the exact spot." "Harry lived in a house located about twenty miles northwest of Wiltonburg. It sits just outside a small town called Placidville." "And I am to settle his estate? How would I do that?" "Well, you'll need to come out here. You can stay in the house while you work. Incidentally, the funeral is set for Thursday. I thought you'd want to attend." I sagged back in my chair. This was a lot to absorb. A funeral two short days from now. An estate to settle. A demand that I spend time in a place I'd never visited, to work on behalf of a man I'd never met. "I can understand your surprise," Ashworth said. "This has all been a bit rushed. Murder tends to mess up the normal progression of things. Anyway, as you know, we had to wait for the police to release Harry's body. And now, well, we'd like to get on with things as quickly as possible." "And you're encouraging me to attend the funeral?" "Yes, I hope you will. Harry was a bit of a recluse. I don't expect a large turn out. Plus, as his executor you'll need to come sometime soon. So, now seems as good a time as any." "And you say I'm the heir?" "I assume you wrote the will?" "Did Harry tell you why he named me in it?" "No, we never discussed you. Harry laid everything out. I just drafted the document according to his wishes." I pulled a deep breath and released it slowly. None of this made any sense to me. "How long do you think it would take me to settle everything up?" "I suppose it depends on how you want to do it. Harry had a great many possessions, both real and personal. I can't imagine you'd want to let them all go without giving them serious thought. Then, there's the house to be sold. Cars to be disposed of." "So what? We're talking a week, maybe two, to wrap all of this up?" "Oh, I'd think at least that, and possibly longer. It's an extremely large house, and Harry had a great many assets." I sat there trying to make sense of it all. My entire life would be turned topsy-turvy. And for what? I'd need to take time off from work. I'd have to line up someone to watch David. I knew Aunt Ella would be delighted to cover for me, but I hated to impose on her. And then I wondered what Jake would think of all this? I cleared my throat. "I'm sorry I can't give you an answer just now. I have to discuss this with my husband. But if I come, I don't want to stay in Harry's house. I didn't know the man that well. I'd feel like an intruder." "That's okay. There's a lovely old inn nearby, or you could bunk down at a motel in Wiltonburg. I'd be happy to make the arrangements for you, if you'd like." "I'll have to get back to you on that." "Either way, let me know. If you're coming for the funeral, I won't bother mailing you a copy of the will. You'd get here before the document reached you." While he chattered on, I listened as the refrigerator beside me hummed to life and the washing machine let forth a beep, telling me my latest load was done. They were familiar, homey sounds, I would miss hearing in the coming days if I followed this man's suggestions. "By the way," Ashworth now said, "are you curious about the estimated value of the estate?" Recalling Harry's winded voice over the phone, I didn't expect much. "Sure." "All told your inheritance comes to just under fifteen million." My eyelids flew open. "Dollars?" I asked, placing my free hand palm down on the kitchen table and drawing several deep breaths. "Yes, of course, dollars," Ashworth answered. "What else would it be?" 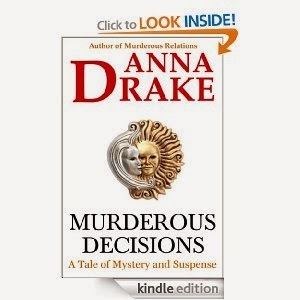 Anna Drake, writing mystery novels with a touch of romance and a bit of suspense. Facebook; Website. Check out Anna's books on AMAZON.